See what some of our customers have said about Metropolitan Design/Build. 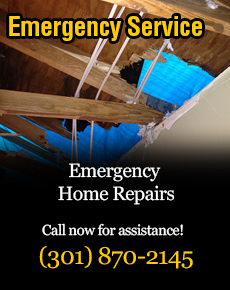 We believe that no other Maryland contractor can match our quality work and personal service. Metropolitan did a great job on our roof. We couldn’t be happier and Omar was very accommodating after a few curve balls were thrown our way. I would highly recommend his company and will probably use him when we go to replace our windows and doors next year!! Our house is located in Mt. Airy Maryland and following a very powerful storm we lost some shingles. We found Metropolitan Design/Build and met directly with Omar who made the whole process a delight. After an inspection of our roof, we learned that there was more than just missing shingles. We had hail damage too! Our Insurance agent was contacted and our home had a new roof and gutters installed quickly. Working with Metropolitan Design/Build was a true pleasure. Omar explained everything very thoroughly and provided many options. He was professional and friendly to work with. Only top quality materials were offered and a wide variety of color options were provided and no corners were cut. The workers were polite and mindful of our property and they left the work area clean with no nails or trash following the installation. We would recommend Metropolitan Design/Build to anyone that requires a new roof, gutters and home improvements. Great company! Our contractor, Omar Kassem designed & built a spacious bright den with a pitched ceiling & sky light on to our home. We then had 2 bathrooms renovated completely & they are both beautiful.We appreciated Omar’s communication, oversight & attention to detail. We highly recommend him to friends & family. We were very pleased with Metropolitan Design/Build from their management down to the roofing team and siding team. We were treated professionally and all of our questions were addressed quickly. Our home was transformed by the quality of workmanship on the roof, replacement windows and siding wrapping work. We highly recommend these guys. Thank you Metropolitan Design/Build. Metropolitan Design/Build has been a terrific company to work with and Charlie Taylor has been simply outstanding in all respects. Quick, responsive and collaborative – this company excels at both workmanship and customer service. I have recommended them to many of our friends and they would be my go to company if these services are needed again. Highly recommend these folks, especially Charlie. Metropolitan Design/Build was great and easy to deal with. Charlie was very professional and I would recommend them to anyone. He was very helpful and the crew that repaired our roof was very thorough. Thanks again. Our experience with Metropolitan Design/Build was pleasant and satisfying. Specifically, Charlie Taylor assisted us in a total roof replacement; replacement and cleaning of copper roofs over two bay windows; and the installation of a gutter cover system. All contacts with Metropolitan were courteous and all work was performed as scheduled. We highly recommend Metropolitan with utmost confidence. One of the best company’s I ever dealt with. All workers on time and did exactly what they were supposed to do. Highly recommend. Thank you Metropolitan Design/Build for your patience while our insurance company investigated the check that they mailed out incorrectly. They tell me that they have apologized for their error any inconvenience this may have caused your company. i too apologize and sincerely thank you for bearing with us. We also thank Metropolitan Design/Build for the fine job they did on our roof. I would highly recommend this company to anyone needing this service. Thanks to John Keller and Jesse Wickline for great job well done. I know they did not do the job, but they were the ones who got it on the way. I thank Mr. Keller for all the help he gave my husband Reggie. And Jesse Wickline you are the one. Thank you for being such a special person with all the help that you gave me with this project with my home. Do not let anyone say to you that you do not know your job. I can say YES you do. Keep up the good work, you and Mr. Keller. We would like to say thanks for a job well done. As the project manager for the replacement of our residential siding and roof repair, we want to commend our contractor, Sherif Kassam, of Metropolitan Design/Build, Inc. for his enthusiasm and commitment to quality. Sherif and his team truly delivered a quality product in a timely manner and they have treated our project as if it were their own. Sherif has exceeded our expectations with his ability to maintain contact with our insurance representative and complete repairs with absolutely minimal disruption and in a timely manner to OUR satisfaction. What an enjoyable process. We would readily work with Sherif and his company on future projects. It was a pleasure doing business with Scott Bissonette. He is a great asset to you company. Thank you for the good work. The windows are fabulous and the doors are magnificent. Abdul and his workers great, very quick & efficient, and they cleaned everything up! We sincerely wanted to thank you for the absolutely professional job by your company over the past several months on our home. Form start to finish it went extremely well and our new roof, window/door installations, siding and trim looks wonderful. We would especially like to thank Sherif and Omar Kassem for all their assistance during this project. They both were extremely patient and helpful in making decisions based on our input and needs. we don’t think the work would have gone nearly as smoothly if it hadn’t been for the two of them. Please tell them “thank you” from the bottom of our hearts… We are so gratefully for their knowledge and expertise on house renovations! Additionally, we would like to thank ChoYih and his crew for the excellent siding job. Cho was a true professional and paid attention to every detail. He and his crew were friendly, polite, and definitely hard working. We were amazed at the cleanup process and don’t believe they left as much as a scrap of paper on our property. Big kudos for that!!! If our future improvements include any services that an be provided by Metropolitan, please be assured that the first call will be made to you.